The following fourteen nominal species, divided into three subgenera, are presently included in Uroteuthis; however this generic and subgeneric arrangement is controversial. Type species.--Uroteuthis bartschi Rehder, 1945, by original designation. 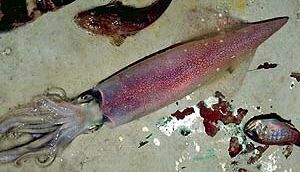 These common inshore squids of the Indo-West Pacific are targets of important large-scale and artesanal fisheries. Uroteuthis spp. are the only squids in the Loliginidae that possess photophores. with a pair of photophores on the ink sac. Proximal margin of sucker rings with semicrescent plate; distal margin with square teeth. Two rows of papillae present; ventral crest absent. Tentacular clubs expanded, suckers in four series. Mantle generally elongate and pointed posteriorly. Fins in adults generally rhomboidal and longer than broad, tapering posteriorly. Fins may or may not reach posterior tip of mantle. Pair of organs on ventral surface of ink sac; intestine separates members of the pair. Figure. Ventral view of the visceral photophores (arrow) of (probably) Uroteuthis edulis, Japanese fish market. Photograph by Sabrina Pankey. Uroteuthis (Uroteuthis) is distinguished from the other two subgenera by a greatly elongate "tail" with "lateral" fins which to not extend to the tip of the tail. In Uroteuthis (Photololigo) and Uroteuthis (Aestuariolus) the elongation of the posterior mantle is variable but not tail-like and when the mantle is elongate, the fins extend along the sides to the posterior tip. Figure. Dorsolateral view of U. (U.) bartchi, holotype, 199 mm ML, male, preserved, Philippine waters at 06°05'N, 121°00'E, showing elongate tail and lateral fins. The bend in the tail is an artifiact of preservation. Photograph by R. Young. Uroteuthis (Photololigo) differs from Uroteuthis (Aestuariolus) in that the modified portion of hectocotylus is less than entire arm; that is, the proximal portion is not modified. In Uroteuthis (Aestuariolus) the entire arm is modified. The structure of the photophores also differs somewhat between the two subgenera. Figure. Top - Oral view of the hectocotylus of Uroteuthis (Photololigo) edulis, 73 mm ML, male, preserved, East China Sea at 21°42'N, 114°50'E, preserved. Note the normal suckers in the proximal region of the arm. Bottom - Oral view of the hectocotylus of Uroteuthis (Aestuariolus) nocticula , 53 mm ML, male, preserved, Bass Strait, Australia at 37°51'S, 144°56'E. Note that only modified suckers are in the proximal region of the arms. Photographs by R. Young. Figure. Dorsal view of Uroteuthis (Aestuariolus) noctiluca, paratype, preserved. Photograph by R. Young. The pair of photophores on the ventral surface of the ink sac in all of these species is perhaps the strongest indication of a close relationship among species to be found in this family. This relationship is further supported by similarities in the hectocotylus and arm-sucker dentition. These characters led Natsukari (1984) to establish the genus Photololigo for the Indo-West Pacific species with photophores, formerly assigned to either Loligo or Doryteuthis. However, Uroteuthis bartschi also has similar photophores, a similar hectocotylus and arm suckers, and an Indo-West Pacific distribution. The elongation of the posterior mantle, which was given generic status in the description of Uroteuthis, is the extreme example in a cline of mantle elongation, similar to that found in the eastern Atlantic where Alloteuthis is the extreme example. This elongation is so extreme in Uroteuthis as to cause a discontinuity in the cline. It thus warrants separate taxonomic status, but the sole recognized species in this taxon possesses all of the generic characters of Photololigo. Thus, it should be included in the genus that Natsukari described. Unfortunately, priority therefore goes to Uroteuthis as the name of the genus, rather than the more descriptive Photololigo. Aside from the photophores, Uroteuthis s.s. and Alloteuthis can be separated based upon position of the fins, lateral versus terminal respectively, and tentacular ring dentition. Therefore, elongation of the mantle end in these two taxa appears to be analogous, not homologous. In a revision of Loliolus, Lu et al. (1985) described a new species: L. noctiluca. They included this species in Loliolus because its hectocotylization was a modification of the entire length of the arm, the original diagnostic character of the genus Loliolus. However, the hectocotylus of L. noctiluca is otherwise very different from those of the other species of Loliolus in that it lacks a ventral crest and both the dorsal and ventral rows of suckers are modified into papillae. The hectocotylus of L. noctiluca is thus similar to those of the Uroteuthis and Photololigo species except that more of the arm is modified, making it the extreme in a cline of the percentage of arm length that is modified by hectocotylization. Furthermore, L. noctiluca was so named because of structures on the ink sac believed to be photophores. These characters, together with similarity in arm-sucker dentition, indicate that this species should be included in the subgenus Photololigo of the genus Uroteuthis. Yeatman (1993) has presented evidence that some species of Uroteuthis (Photololigo) are actually species complexes. The Indo-West Pacific distribution of all of these species supports the contention that they comprise a natural, closely related species group. Alexeyev, D.O. 1991. Systematics, Phylogeny, Distribution, Biology, and Prospects for Fishery of the Squid Suborder Myopsida. Candidate in Biological Sciences Thesis, Institute of Oceanography of the Russian Academy of Sciences, Moscow. 129 pages. (In Russian). Alexeyev, D.O. 1992. The Systematic Position of Bioluminescent Squids of the Family Loliginidae (Cephalopoda, Myopsida). Zoologeskiy Zhurnal, 71(11):12-23. (In Russian). Lu, C.C., C.F.E. Roper, and R.W. Tait. 1985. A Revision of Loliolus (Cephalopoda; Loliginidae), Including L. noctiluca, a New Species of Squid from Australian Waters. Proceedings of the Royal Society of Victoria, 97(2):59-85. Natsukari, Y. 1984. Taxonomical and Morphological Studies on the Loliginid Squids-- IV. Two New Genera of the Family Loliginidae. Venus, The Japanese Journal of Malacology, 43(3):229-239. Yeatman, J. 1993. Genetic and Morphological Aspects of Australian Photololigo spp. (Loliginidae: Cephalopoda). Ph.D. Thesis, James Cook University, North Queensland, Australia. Page: Tree of Life Uroteuthis Rehder, 1945. Authored by Michael Vecchione. The TEXT of this page is licensed under the Creative Commons Attribution-NonCommercial License - Version 3.0. Note that images and other media featured on this page are each governed by their own license, and they may or may not be available for reuse. Click on an image or a media link to access the media data window, which provides the relevant licensing information. For the general terms and conditions of ToL material reuse and redistribution, please see the Tree of Life Copyright Policies.